White-coloured woolen blanket with a wide indigo stripe woven into the top and bottom. Four short narrow lines of indigo-coloured yarn (points) have been woven horizontally above the stripe at one end. A commercial label has been sewn into one corner that reads: All Genuine Hudson’s Bay Point Blankets Bear This Seal/The Seal of Quality/Made in England. A red-coloured “three point” version is also included in the image. Read more about blankets - enter 'blankets' in the search box to your left. Chief Factor Barnston is shown wearing a point blanket coat with which famous author? Check the Beaver Index - e.g., Hudson's Bay 'Point' Blankets, by Albert E. Dodman, December 1926. Or enter 'blanket' in the keywords field. The Hudson’s Bay Company “point” blanket became one of the more popular trade goods, and remains an enduring symbol of the Canadian fur trade. 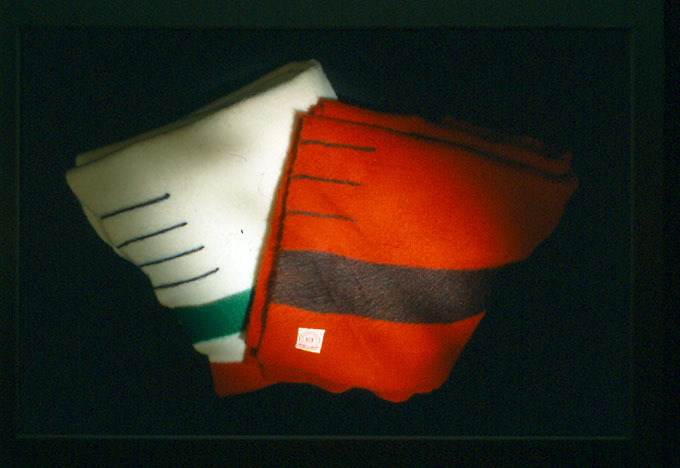 By the late 1600s, the Hudson’s Bay Company offered woolen blankets with red stripes for trade. The “point” blanket was introduced into the fur trade in 1780 on the advice of M. Germain Maugenest. The "point" system had been introduced by French weavers to indicate the finished size of a blanket. The word “point” derives from the French empointer meaning "to make threaded stitches on cloth". According to the point system, each blanket is graded as to weight and size. These points are actually short lines woven into the side of each blanket. A full point measured 10 to 14 cm, and a half-point measured half that length. The number of points represented the overall finished size of the blanket, not its value in terms of beaver pelts as is sometimes believed. However, there were times when the exchange value was very close to the number of blanket points. A standard one-point blanket was 0.8 metres wide and 2.44 metres long. Blankets were popular with the Aboriginal peoples and they were often used for clothing. The white three-point blanket was ideal for a hunter’s winter capote since it provided excellent camouflage against the snow. There were also solid-coloured blankets in indigo, scarlet, green and light blue. The white blankets with stripes of green, red and yellow, sometimes referred to as "chief's blankets", were introduced around 1800. Originally the weavers of Witney, Oxfordshire were the principal suppliers of blankets for the Hudson’s Bay Company. The wool was (and still is) a blend of varieties from England, Wales, New Zealand and India, each selected for qualities that will make the blanket quite water-resistant, soft, warm and strong.